We haven’t got a site any more or a riverside store but we are not dead yet. Far from it!!! 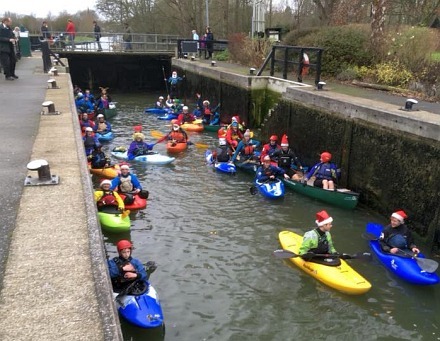 Kingfisher Canoe Club managed to get 33 boats and equipment to the river to maintain the tradition of the Christmas Mince Pie Paddle All ages circuit through the lock. 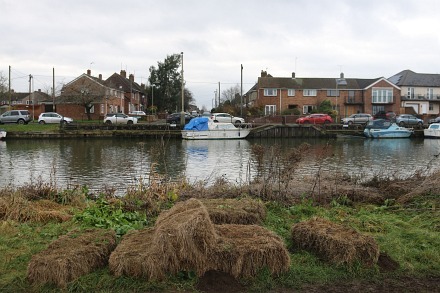 They met up with Richard and the team at the lock and then went round by Swift Ditch. 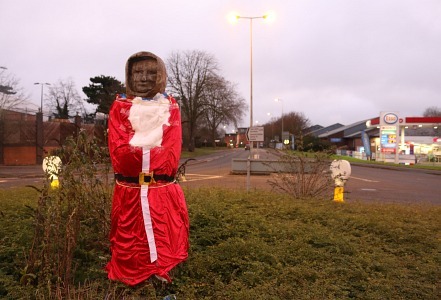 We are still hoping for good news from the VWHDC (Vale of White Horse District Council). There could be no better Christmas present, but it hasn’t arrived yet, and so the campaign continues. Thanks to all who supported us by signing the petition (some 1200+ to date). 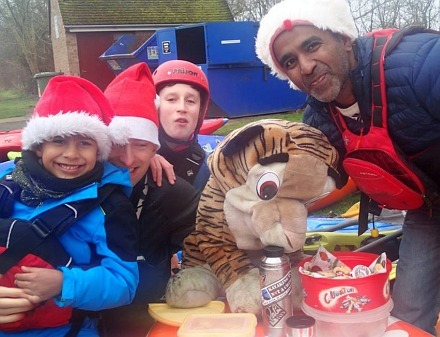 Happy Christmas to all and thanks to all who have and continue to support us. 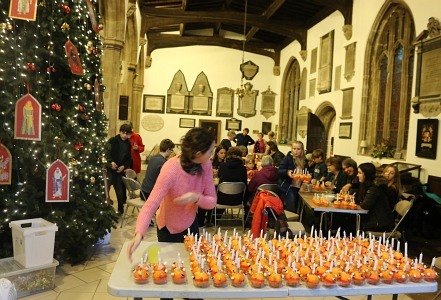 At St Helen’s Church a team of people helped to make the Christingles for the Christmas Eve service at 4:30 pm. 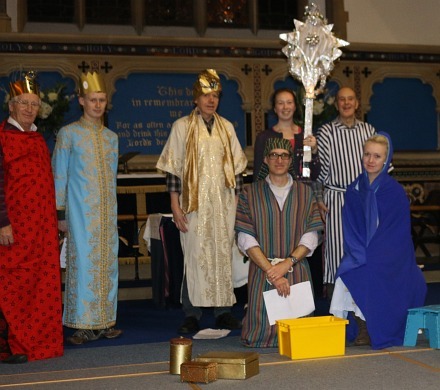 At Trinity we had a rehearsal for the Torchlight Service, also at 4:30pm on Christmas Eve. This year an apprentice astronomer spots a new star in the sky that the older astronomers (wise men) cannot explain. It leads to a stable in Bethlehem and some unexpected happenings. 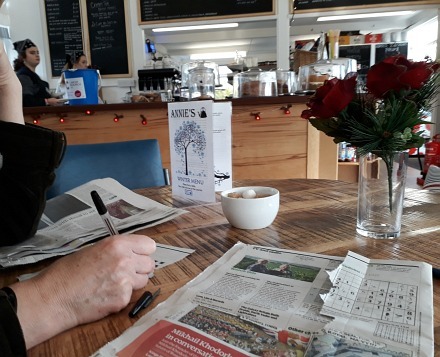 Yesterday we visited the original Annie’s Tearooms at the Canal in Thrupp (near Kidlington) and enjoyed Sweet potatoe soup (featured on the Not Abingdon Blog). 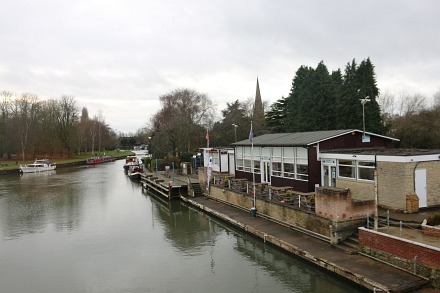 Today we started a walk at Annie’s at the Boathouse in Abingdon. We split the sudoku and crossword so we both had a puzzle to do, then enjoyed some warming Leek and potato soup. We noticed that other Thames walkers had also stopped off here for refreshments. We left Annie’s behind and walked along the far bank of the River Thames. For anybody driving along the A34, Abingdon might just look like a place of business parks, and out of town shopping. 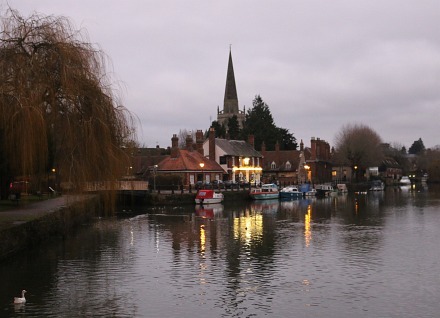 but Abingdon is a river town with all its buildings on one bank of the River Thames. 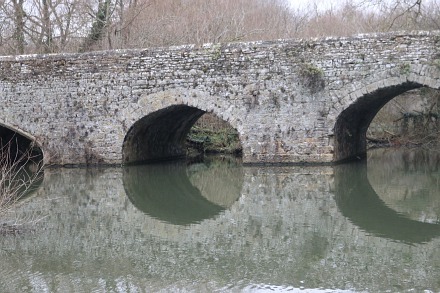 take the route via Sutton Courtney (next Thames crossing) and back to Abingdon – a seven mile walk. The spire of St Helen’s Church can be seen for miles around, and the bright lights of the Old Anchor are there to welcome visitors on winter evenings. The splendid Old County Hall was completed in 1682 by Christopher Kempster, one of Wren’s master masons during the building of St Paul’s Cathedral. 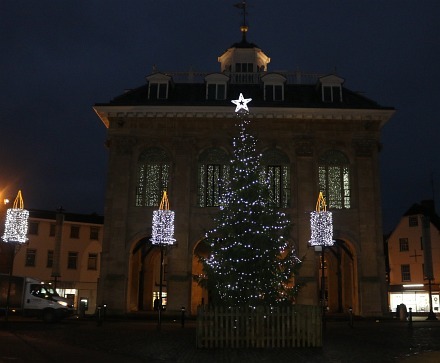 The County Hall houses the town’s museum, and is well lit up at this time of year. The 21st December, the Winter Solstice, is the shortest day of the year. The 22nd December will be longer. Winter solstice is celebrated by some people as the darkness turning back to light. 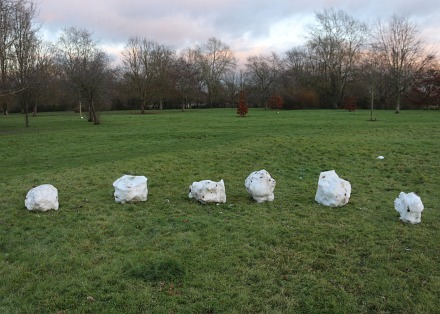 The snow has melted but I did get a picture of snow balls in the shape of a stone circle in the Abbey Meadow a few days ago. People still go to stone circles to celebrate the Winter Solstice – four days ahead of the celebration of the birth of Jesus Christ.